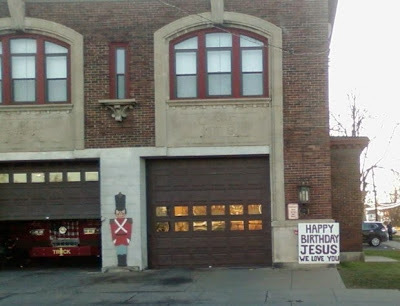 This sign outside a firehouse in Utica, New York, says “Happy Birthday Jesus We Love You” and now the atheist organization The Freedom from Religion Foundation is demanding that the sign be removed. The organization has sent two notes to Utica area authorities, the first to fire chief Russell Brooks in April 2014, and the second to Utica Mayor Robert Palmieri on December 10th. Brooks ignored the earlier complaints because the Thomas More Law Center, a conservative legal firm, advised him that the sign was constitutional after a complaint by the ACLU in 2007. Enraged atheists are like an early Christmas gift. So I guess it's like Christmas year round.